Fair weather and plentiful streams, wanderers. As we get closer to the release, we’re shaking the dust of this site, with the intention of getting back to regular content again. 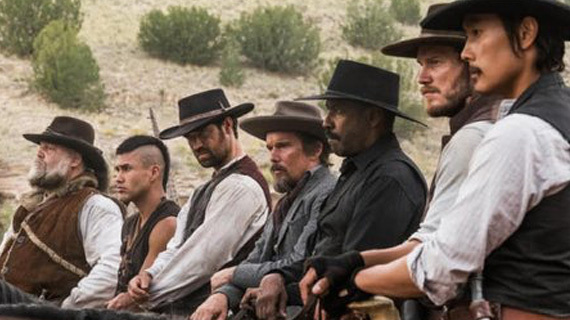 Today’s piece is about the new version of one of the most Far Western movies out there, The Magnificent Seven. For the (surely) few of you who don’t already know, the original Magnificent Seven was a 1960 Western remake of the 1954 Akira Kurosawa film, The Seven Samurai — the tale of a group of Bad Men (gunslingers and outlaws in the Western, masterless ronin in the Samurai film) hired to protect a village from a large gang of bandits. The tale has been re-told in many forms: science fiction (Battle Beyond The Stars), children’s films (A Bug’s Life), and a bunch of kung-fu & wuxia films (Duel of the Seven Tigers, Seven Warriors, Seven Swords, etc.). The combination of eastern and western is why we think of this as one of the most Far Western movies out there — and in fact, one of our early playtest games was literally a lift of this story, with a collection of Dust Road Wanderers gathered to protect a town from a bandit army. Now, the film has been remade, for release this Fall, and the first trailer is out. The new version features Denzel Washington in the Yul Brynner role, and the rest of his Seven include Chris Pratt, Ethan Hawke, Vincent D’Onofrio, Martin Sensmeier, Manuel Garcia-Rulfo, and Byung-hun Lee. Garcia-Rulfo is playing a Native American, and he and Lee (from the equally Far Western movie, The Good, The Bad & The Weird)add a much more diverse look to the cast than the original. The Eli Wallach bandit chief role is played by Peter Sarsgaard.